If you’ve been working on optimizing the navigation, copywriting and calls to action on your website – you’re off to a great start. And if your site takes more than 3 seconds to load, Akamai reports that 40% of visitors will abandon. Platforms like Fasttimes let’s you see how your site speed compares to the top 1000 sites that get the most traffic. There are a lot of platforms out there that will generate a report on your site’s speed. But you should also consider continuous speed monitoring. 3rd party scripts and code can bog down your site’s speed without you ever knowing. Also, your service provider may make changes that you’re unaware of that could hamper page speed. Maxly provides hourly updates detailing any issues that are harming your page load speeds. 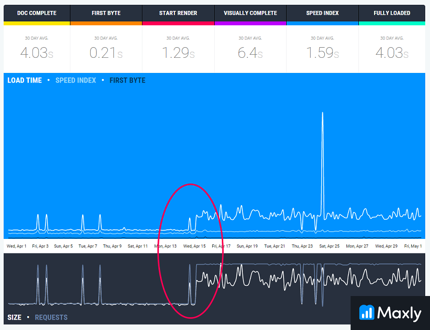 Take a look at how Twitter’s site speed nearly tripled when they did a site redesign. Page load speed doesn’t just effect conversions. Google and many other search engines are giving sites with faster page load speeds higher rankings. You’re never going to know what your competition s up to if you don’t do a little monitoring of their activity. I generally include a couple of Competitor Reviews when I’m conducting an analysis on a client website. This way we can see what they’re doing that might keep them ahead of the game. You can go further than that with platforms that do the monitoring for you. Platforms such as Kompyte can routinely visit the websites, advertisements, newsletters and social profiles of your competitors. Notification are sent each time your competition changes their prices, launches a campaign or a new competitor enters the scene. Would you like to see which of your competitor’s content is the most popular? Ahrefs Content Explorer reveals the content that is trending in a particular industry. It also shows which content is being shared, how often and where. They also have the largest backlink index so that businesses can find quality linking partners. Billions of pages are crawled every 15 minutes. You’ve probably seen sites such as Amazon use personalization by greeting visitors by name and showing products that they might be interested in. Personalization can go further than that by showing specific pages and marketing messages based on a visitors behavior and choices. Evergage helped Slideshark, a division of Brainshark, utilize personalization to increase conversions. They were hoping to cross-sell, upsell and educate visitors based on specific choices that they made. At the perfect time, Brainshark could share features that would encourage visitors to sign up for a 30 day trial. They also included personalization on their website to promote ebooks, PowerPoint templates and webinars. Trial sign ups were increased by 150% for Slideshark. They also saw a 15% increase in registrations for their webinar and they saw their sales inquiries increase by 9 times. The personalization strategy influenced over $1.1 million in the Brainshark sales pipeline. comScore has reported that 4 out of 5 consumers are shopping on smart phones and 78% of all mobile searches are ending in a purchase. They also report that Mobile Internet Usage passed up Desktop Internet Usage last summer. 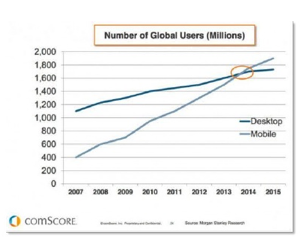 In other words, mobile internet users are now the majority. And if you’re not keeping them in mind, you’re going to lose out. Take a look at their site on a mobile device before and after they implemented. The new mobile design brought impressive results. 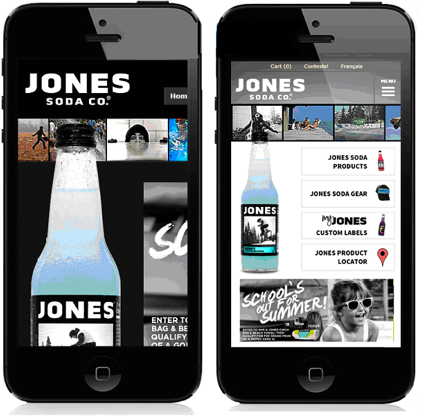 By adding a presentation that was optimized for mobile users, Jones Soda Co. was able to increase conversions by 103.59. They saw a 127.78% increase in transactions along with 43.07% increase in average order value. The most impressive increase for Jones Soda Co. was a 225.88 increase in revenue. Crazy Egg saw a 64% increase in conversions and an additional $21,000 in monthly revenue after adding an explainer video to their site. An article by Emarketer shares how effective interactive videos are. With data provided by Sizmek, studies show that 70% of interactive videos are watched all the way to the end. Don’t just upload a video hoping for good results. 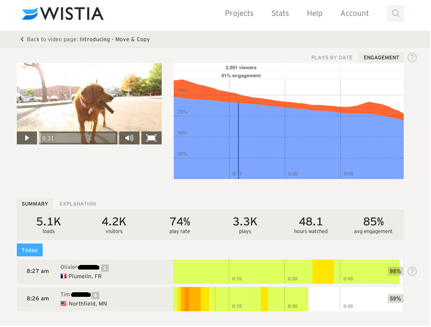 Use analytics to determine how visitors are engaging with your video. As you can see below in these Wistia analytics, this video had a play rate of 74% and 85% engagement. The individual bar graphs show where viewers dropped off and where they replayed the video. It’s discouraging that Baymard Institute has reported that 65% of all visitors will abandon their shopping carts. But hope shouldn’t be lost. Abandoned visitors are worth going after and re-cooping your investment. Servicing the ski and mountain industry, Liftopia offered deals up to 85% but were confused why they would see such a high shopping cart abandonment rate. After implementing Rejoiner to re-capture those lost sales, analytics revealed that they were losing close to $1.3 million during their prime season each month. An automated sequence was created that sent an email 30 minutes after abandonment and then again 24 hours later. When recipients clicked the link within the email, their shopping carts were automatically recreated so that their transaction could be completed quickly. 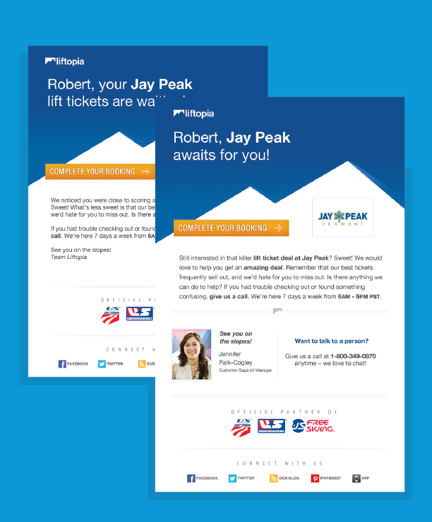 In using this retargeting strategy, Liftopia was able to re-coop 17% of their revenue. In just 4 months time, they added $714,251 to their top line revenue. Optimizing your site is an important start. But by adding these strategies you could see significant growth in your bottom line. Make sure your page load speeds are fast so that you don’t risk losing visitors. Spy on competitors to see what they’re doing. Make visitors feel like you’re speaking directly to them by personalizing their experience. Make sure you market to your growing mobile audience. And go after abandoned visitors. There is hope. Marie Dean is the Innovation Director at ConversionLifters. She has helped businesses increase their conversions, sales and revenue with website audits, heat mapping, split tests and user testing for over 10 years.